Alex Mitchell is a former state political editor and columnist for Sydney’s Sun-Herald, and arrived at Crikey after a long career in the Canberra press gallery and overseas. The new Premier's core group of senior ministers are all long-time Berejiklian supporters. Liberal MPs have endorsed Gladys Berejiklian as the 45th premier of NSW, the state’s seventh premier in 12 years. Here's what's up with that. Why did Mike Baird resign? And who is waiting in the wings to replace him? Shonks and spivs can breathe a little easier in NSW, with ICAC losing its commissioner -- and its cojones. Mike Baird has just lost two of his most promising cabinet members, and have been replaced by much less experienced members. Most observers believe that de-throning Latham is the real purpose of the Coalition’s carefully orchestrated review of ICAC's management and performance. Lucy Turnbull has a very ambitious plan to revamp Sydney into three cities. And it just so happens NSW is flush with cash from the sale of its poles and wires. Have Sam Neill and Jimmy Barnes shamed Baird into another policy backflip? 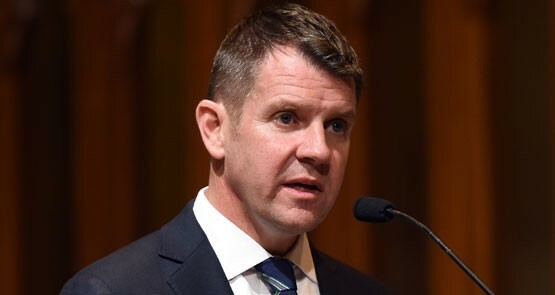 Mike Baird is under intense pressure over his government's controversial Sydney lockout laws.